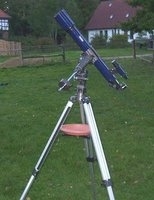 Since August 2007 I’m the proud owner of a Sky-Watcher 8″ Dobson. This scope is not as ponderous as it looks. The set-up is done within a few minutes. So it’s great for unexpected clear nights or if you have little time to observe. I’ve already seen a lot with my Dobson and I hope to see much more with this telescope! I started this hobby with a cheap Bresser Skylux 70/700. It’s thanks to this telescope that I found my war around in the sky. This small refractor is really good for observing clusters, but also for the brighter nebulae and galaxies. I also own a 10×50 binocular which I sometimes use for stargazing.